Note: This is part one of a series as current film production practices do not allow certain details of the film-making process to be released until after the film has opened in cinemas. Please look out for more details and behind-the-scenes info next month. Ever wonder what it’s like to work on a film? And not just ANY film, but one directed by none other than Sir Ridley Scott? This week I got the chance to chat with my friend, Nikeah Forde, about her work on the upcoming film Prometheus starring Michael Fassbender. Veronica: Who do you work for and what do you do? Nikeah: I am freelance, and a visual effects co-ordinator. On Prometheus I was a replacement Data Wrangler. V: What does a data wrangler do? N: A data wrangler takes all notes and measurements on set that the visual effects companies will need to recreate the scene virtually later on. I would take camera notes; height, tilt, distance to subject as well as lens details, what sort of set up the camera was on. V: You’ve been on the crew for several other films and a TV mini-series including The Pacific, Chronicles of Narnia: The Voyage of the Dawn Treader and, more recently, the Tim Burton film Dark Shadows. 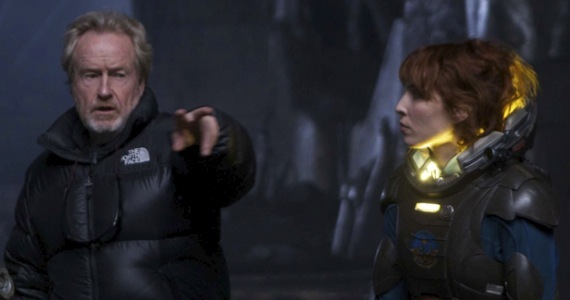 Was there anything unique about working on Prometheus compared to other films you’ve worked on? N: Prometheus is the only film I’ve worked on that shot in stereo, which means that for each shot there are two cameras side by side, so stereo means it will be in 3D. If you have two cameras they act like two eyes and depending on the crossover angle and the distance between them you create depth. You can shoot with one camera and later on cut each frame into depths to create 3D, this is called Post-Conversion, it’s not as good though. It’s super time consuming, but there are companies whose sole job is post-conversion. Each frame needs to have the work done to it, that’s the same with all VFX. That’s why our section of the credits is so long! V: Speaking of credits, you told me that your name won’t be in the Prometheus credits, despite working on the film, why is that? N: I just stood in for two days when their Lead Wrangler was sick. There is usually a minimum amount of days that you need to work on a film before you get listed in the credits. V: Did you get to work with any of the stars of the film? With whom and what did you work on with them? N: I did...I can’t really say. After the release [I’ll be able], but you will have to put a spoiler label on it. We all sign non-disclosure agreements when we come on board. V: What was it like working with Sir Ridley Scott? N: He is an amazing director, he knows exactly what he wants. Which is perfect on set. It’s the best trait a director can have. V: What’s the best part of working on a film? N: The crew, you are working such long and hard hours that you really bond with everyone. V: What’s the most challenging part? N: The hours, you have no time for a social life once you are on set. It’s pretty hard, but if you reality check yourself every now and again and realize that you have a pretty cool job it’s easier. V: Any perks from working on Prometheus? N: I got to explore the sets which were amazing. V: Do you plan to see Prometheus when it hits theatres? V: Thanks so much for taking the time to answer my questions. I can’t wait to get more details next month and maybe see some behind-the-scenes photos too! N: Not a problem, [we’ll] speak soon! Wow, very nice job Veronica! It always amazes me when the people who work on the sets explain their jobs! It really is a team effort, so much goes into it. Ridley is a fine director, and works with some very talented people. What a small world it is. Great interview Veronica. I'm sure we all look forward to many more article contributions from you! Wow, great post Veronica! Very interesting, I'm learning a lot in this blog. Thank you :) . Thanks for your comments Ladies! I'm really looking forward to posting another article soon AND to posting all the inside details my friend is saving for after the release of Prometheus. She said she even has a few photos!